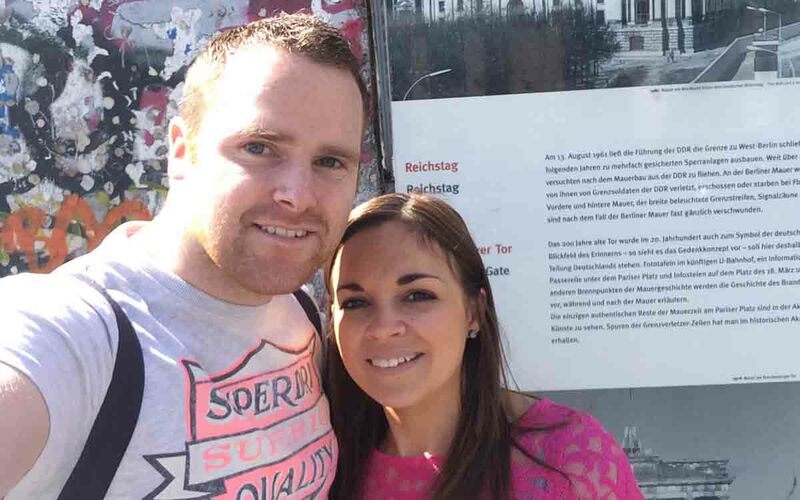 We recently visited Berlin for the European Search Awards as one of my clients was up for an award (Expedia Ireland). With the awards ceremony taking place in the Hilton Hotel in the city centre we stayed there on our first night before relocating to the Crowne Plaza at the famous Potsdamer Platz. We stayed for 3 nights and managed to take in a lot of the city during our stay, a city that left us more than impressed. So following a good lie in and a bit of a hangover, we checked out of the Hilton and grabbed a taxi to make the trip across the city to the Crowne Plaza Hotel. 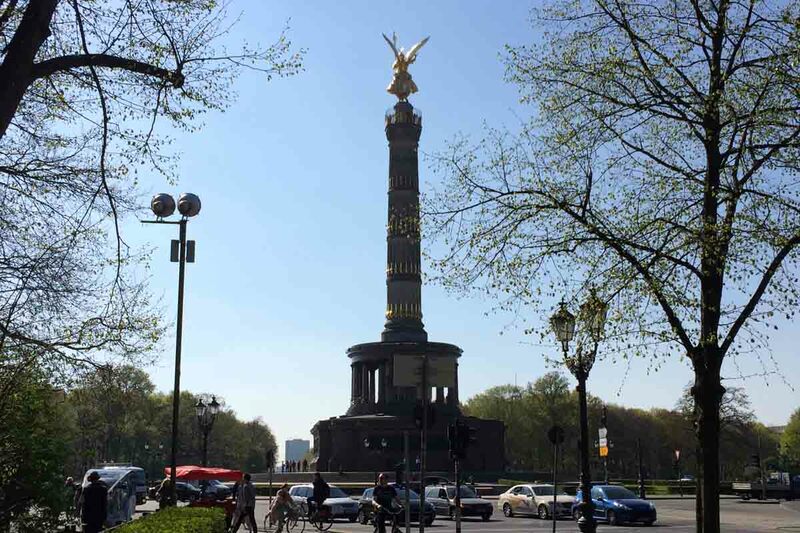 For anyone who has ever been to Berlin before, we were heading from one Platz to another – from Alexander to Potsdamer. Platz is open space or square in German so these are popular meeting and tourist areas. Having checked in at Crowne Plaza we decided to find our bearings and set off on foot exploring a bit of the city. First up was Potsdamer Platz and we took a quick walk around the large shopping centre there (this was only about a 5 minute walk from our hotel). 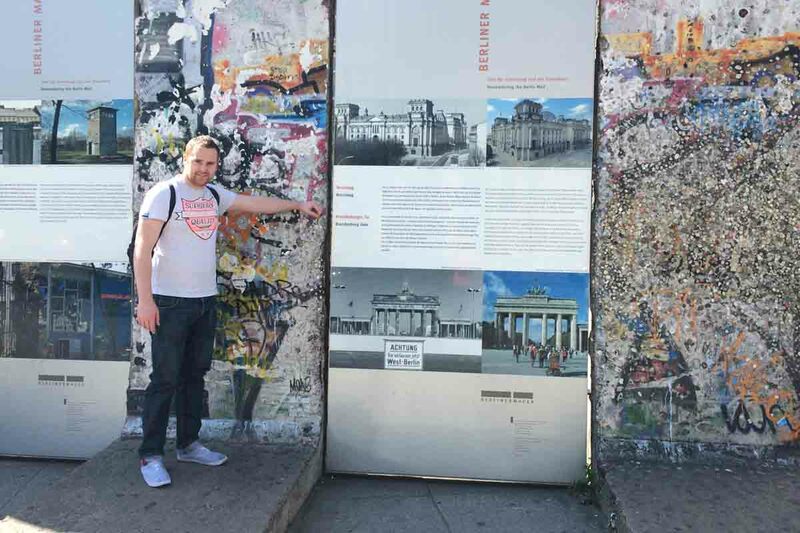 As with much of Berlin you will see bits of the famous old Berlin Wall dotted around the city so we grabbed a chance to get a snap beside the wall at Potsdamer. From here we started to walk towards the world famous Brandenburg Gate and on route passed the Holocaust Memorial, an extremely poignant site that leaves you with no option but to take a quiet moment and reflect. Two of Berlin’s most famous landmarks are within a few hundred metres of each other – the Brandenburg Gate and the Reichstag building. 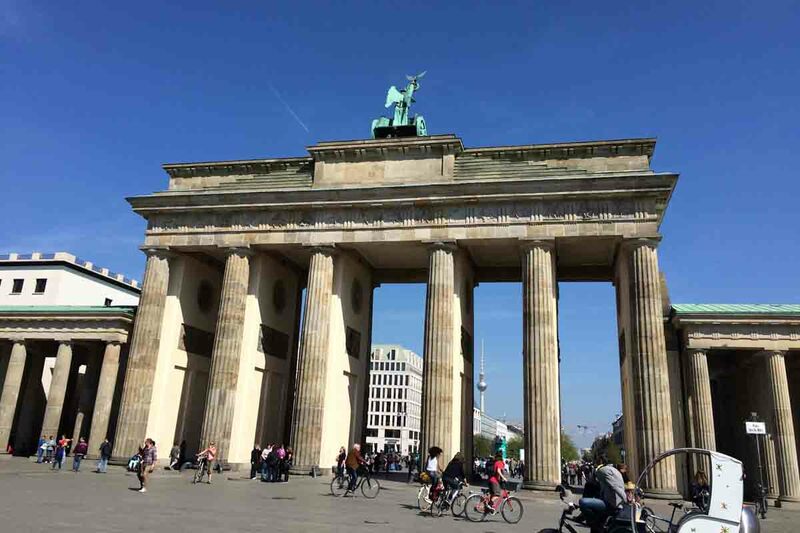 Built from sandstone, the Brandenburg Gate is arguably Berlin’s most famous site and attracts thousands of tourists every year (if not every day). The wall is a symbol of German unity and despite getting damaged in World War 2 it has been fully restored and certainly takes the breath away. The impressive arches at Brandenburg Gate are also the entry to the popular shopping area of “Unter den Linden”, a street with lots of popular high street and boutique shops flagged with linden trees. A walk along this street also takes you to the city palace but that was for another day as our next stop was Reichstag and the surrounding park. The Reichstag is another important building in Berlin and is actually the home of the German parliament. The huge gardens in front of the building attract lots of locals and tourists so we decided to follow the lead of those around us and relax on the grass and take it all in! 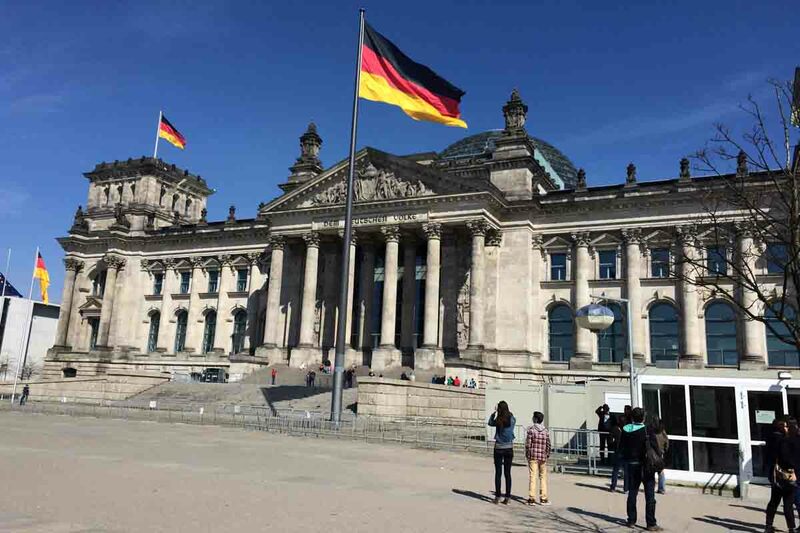 We were fulling full of energy and as it was a wonderfully picturesque spring day we got our walk on and set off from the Reichstag to Berlin Zoo – a 4km walk through beautiful parkland. The walk took us around an hour and a half as we wanted to take in everything around us. In the distance we could see the Victory Column which dominates the skyline and this was a good marker as to how close we were to the zoo – unfortunately from here, we took a wrong turn and this added to our walk. We arrived at the zoo around 4.30pm and although the zoo itself was still open for another hour, the gates were closing and unfortunately we weren’t allowed in. This was a bit disappointing and put a bit of a dampener on the day, a day that had been otherwise great. Having done lots of walking we decided to talk the metro back to our hotel and grab some food and call it a night. For those of you who enjoy exploring a city (and even those that don’t), Berlin is great to explore on foot. The city itself is extremely flat so getting around on foot is a breeze. We were a little disappointed by the metro lines though which were confusing – very un-German like. Having walked the feet of ourselves we decided to just relax in the hotel for the night and enjoy a meal. 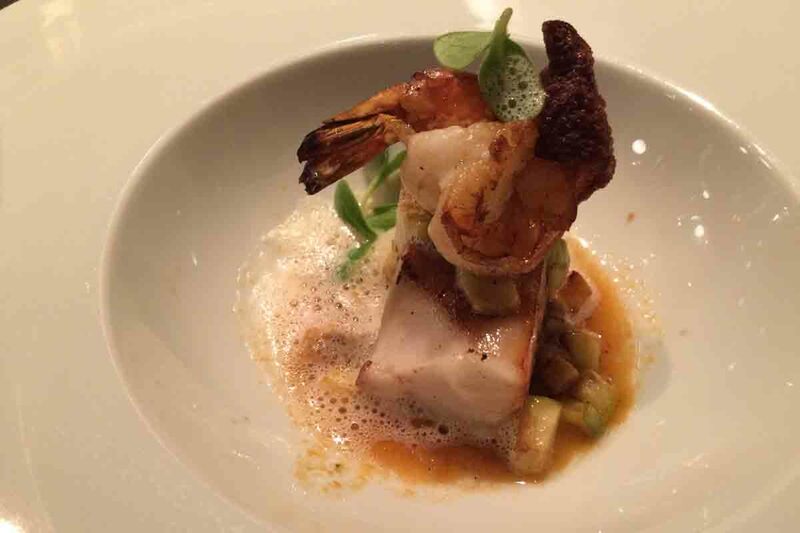 We tucked into 3 courses and were suitably impressed. Rather than boring you with the details here, we’ll just share some of the photos with you and you can check out our review in our next blog. With dessert over it was time to hit the sack as the bus tour was on the cards for day 2, along with the zoo – finally. There are a number of bus tours available in Berlin – I think we counted about 6 or 7 different tours at one point. We got the bus at Potsdamer Platz as there are a lot of stops there and it meant very little walking – which we were glad of in this instance. The weather was perfect again so we made our way to the top of the bus to take in the views. We love hoping on the bus tours when we visit any city as it’s a great way to get your bearings and you get to visit the main hotspots in a relatively short period of time. 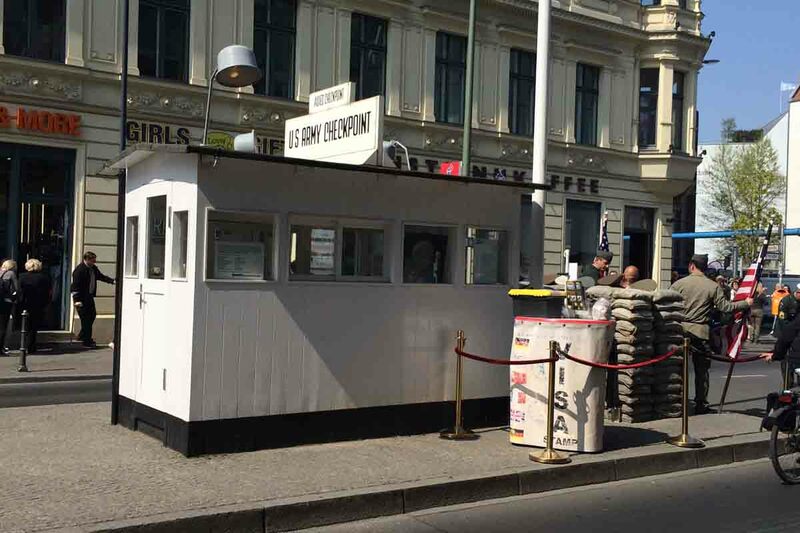 Another of Berlin’s famous attractions, Checkpoint Charlie was the first stop on our bus tour. It’s only a short drive from Potsdamer Platz and was really well located from our hotel. The site attracts plenty of tourists throughout the day with lot’s of Americans queuing up for photos with the soldiers and guards who still stand at the checkpoint. 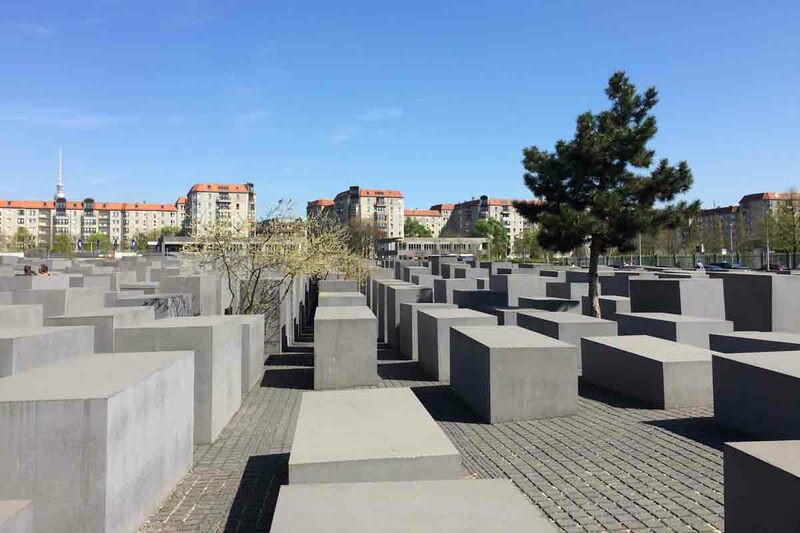 This area was a crossing point between the east and west of the city during the war and has become a popular tourist stop ever since the fall of the Berlin Wall in 1989. There’s a museum at Checkpoint Charlie if you wish to explore the area more but our stay was brief and we were soon back on the bus and making our way to Gendarmenmarkt. By the time we got off the bus at Gendarmenmarkt we realised we had come full circle as the Hilton Hotel in which we stayed at for the awards is located here. This large square is surrounded by shops, cafes and bars with a number of impressive buildings smack bang in the middle of the square, truly one of the nicest areas of the city. It is home to the Konzerthaus concert hall and the French and German cathedral, making for some great photo opportunities. 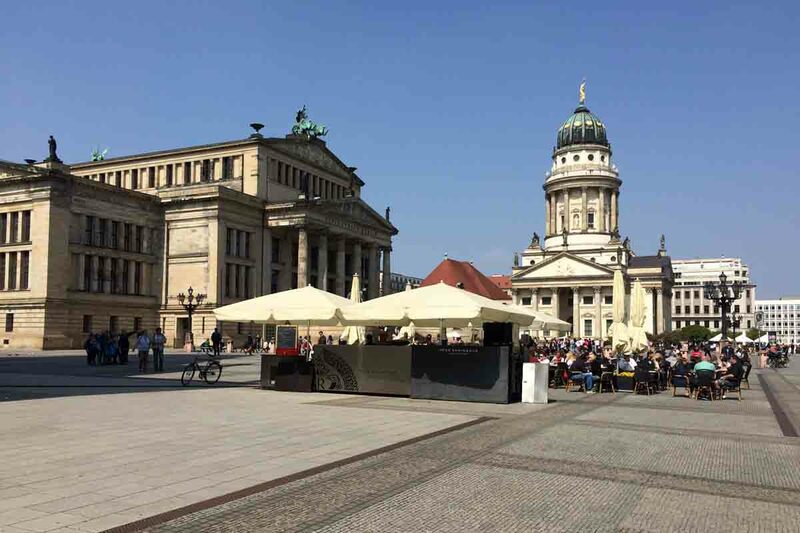 If you ever visit Berlin and are blessed with good weather, be sure to get yourself along the Gendarmenmarkt. 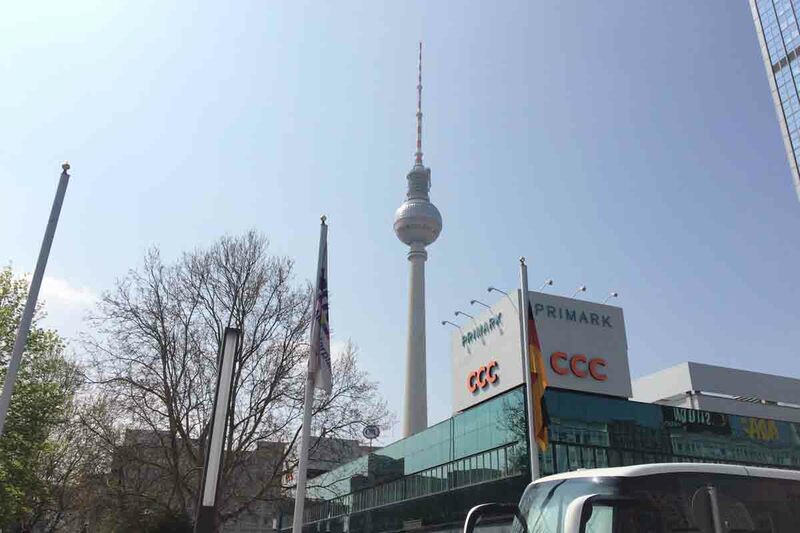 Next up was a quick trip to Alexanderplatz and Fernsehturm (also known as the TV Tower). The TV Tower dominates the skyline here and has a revolving restaurant which apparently has unrivaled panoramic views of the city. Unfortunately we didn’t get to check it out so but it is on our list of things to do for our next trip. We decided to take the metro from Alexanderplatz to Berlin Zoo as it was approaching 2pm and didn’t want a repeat of the previous day. Tickets bought, in we walked to the zoo and it was animal selfie time. 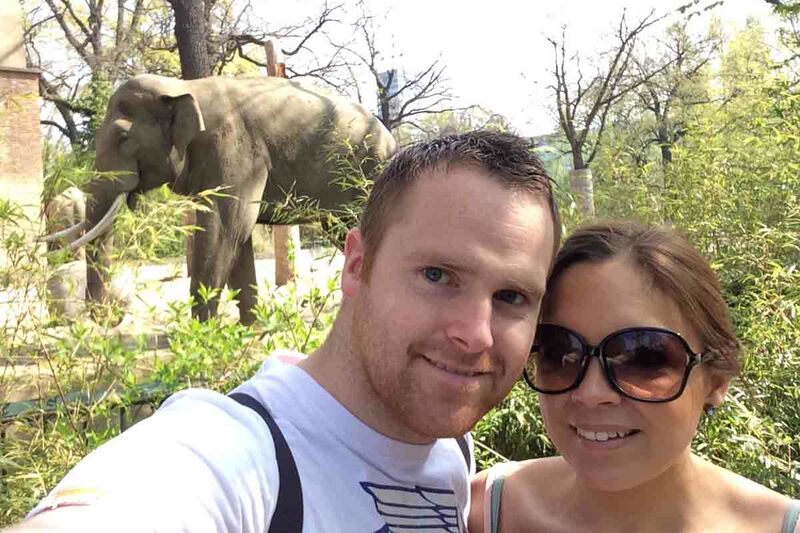 Tickets to the zoo can be purchased in advance online and cost €13 for adults and €6.50 for kids. Deals are available for families and there is a combo deal available for the Berlin Aquarium which is located next door. Be sure to give yourself time at the zoo and do wear suitable footwear as there is lots of walking to do. We spent about 90 minutes in the zoo and headed to the nearby Europa Centre for a drink afterwards before hoping onto the city bus and making our way back to Potsdamer Platz. Our last stop on day two was a lovely wee delicatesan called Lindner which made the most wonderful little pastries. 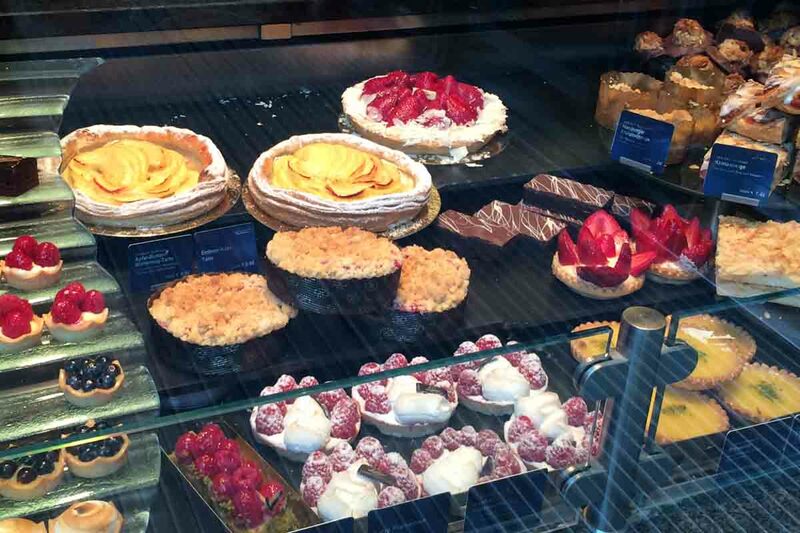 We grabbed a selection of pastries to enjoy back at our hotel, and enjoy we did. 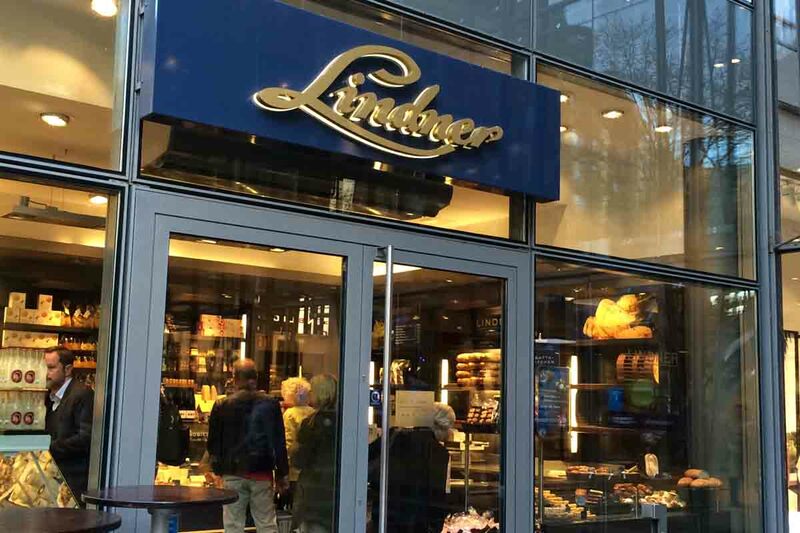 Regular visitors to our blog will know how much we enjoy our sweet treats and desserts, and so impressed were we with Lindner that it was our first port of call on our final day in Berlin. Day two – done! The good thing about the bus tours in Berlin is that the ticket is 24 hour so we were able to use it again to get about for most of our last day in the city. Unfortunately there was some demos in the city centre which looked at one point as if it was likely to delay us getting to the airport but there were no real worries in the end. We only had a couple of hours to explore the city on the final day so we spent most of it on the bus taking in the sights of the city from the upper deck. 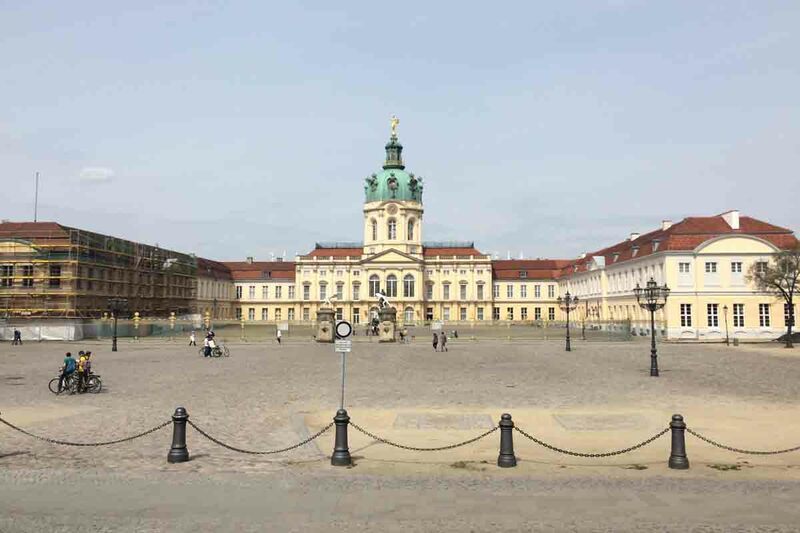 From the palaces of Charlottenburg and Bellevue to the spectacular Lustgarten (the Garden of Pleasure), our final few hours were spent basking in some of Berlins most majestic and historic buildings. Before heading back to the hotel to grab our bags and catch our flight, we stopped of at Kurfürstendamm, a premier shopping boulevard in Berlin with some amazing boutique and high street shops, an area we probably wished we had more time to explore (although the bank balance was happy we didn’t). This was my second time in Berlin after a short stay in the city while travelling through Europe a few years ago while it was Helen’s first visit to the German capital. To say we were both blown away is an understatement and the city would be up there as the cleanest we have ever visited. This is a city we would highly recommend visiting and one we will certainly be back to. We flew out from Dublin with Ryanair who offer some really good prices flying into Berlin Schönefeld Airport.